i woke up this morning feeling really congested and slight feverish!! on top of that my throat is somewhat hurting as well...oh no...am i getting a flu? Hopefully not!!! I am starting my night shift work schedule tomorrow...kakahiya naman kung mag-ca-call-in-sick ako!!! i'm drug up already with medication para hindi na lumala, sana mawala na ito...!!! just got home from store hopping for a gift for my preceptor. This week will be the last week for my orientation at work, and I was planning to give my precetor a thank you gift...and guess what i spent almost half of my day looking for the perfect gift, but i'm home empty handed!!! Why is it so hard to find a gift? First I would say that I don't really know the girl that I'm giving the gift to. I just know few personal things about her. The only conversations we had is about work. I tried the mall, target, bed bad and beyond store and still no luck!!! I met with my nursing friends at IHOP for breakfast today. I haven't seen them for months already and it was fun to see them again!! Ofcourse on top of the tasty food we got we chit-chatted about our life at work and on what's new in our personal life...!! Hay, I just hope that we get to meet again soon. Now that we are working at different hospitals and having different schedules make it hard to set a day for get together. get to know me more!!! i've been tag by mich!!! thanks sis!! Q1: What are you doing 10 years ago? 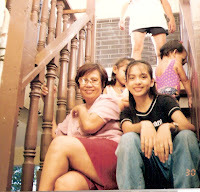 1997- 3rd year highschool ang lola nyo!!! 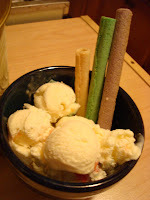 sabi nga ng mommy ko...mahilig daw ako sa "flavor of the month" during this time!!! paano ba naman iba-iba ang mga naghahatid at dumadalaw sa akin at iba-iba din ang tumatawag sa bahay namin... i am already friends with my beautiful friendships...at minsan-minsan nakakatakas kaming gumimik!! 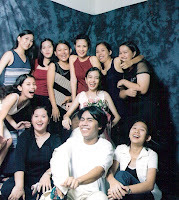 oh pahabol we had our JS prom this year...and this one is the best memories for my HS life..saya kasi eh!!! Q2: What were you doing 1 year ago? Sept 2006- i was on my last semester of nursing school. totally stressing out because holiday season is coming up and it will be too depressing if i don't graduate! during this time i was also planning our church wedding!! and i am proud to say that i passed my nursing school and our wedding was a success!!! Q3: What are 5 snacks you enjoy? Q4: What are 5 songs you know the lyrics to? i am my own song writter!!! kaya sad to say, i somehow manage to mess up the lyrics of all the song i sing!!! having an argument with my husband!!! i don't know with you, but i had a great day at work today..!! maybe because our census is low and we only had a total of 9 babies delivered for the whole shift!! that's a good number considering our hospital averages 17 babies per shift...talk about Philippine General Hospital ng Van Nuys California!!! My co-worker bought bagels and cream cheese for everyone for breakfast... yippee..! !buti nalang, hindi ako nakakain ng breakfast eh. the come lunch time, I just ate at the cafeteria..it's a so-so chicken food!! So when it's time to go home..i could not have a smooth sailing drive home..walang traffic!!! As soon as i got home, hopped in the bathroom for one hot shower...hay sarap!!! then while drying my hair, i need to ofcourse watch my daily dose of teleserye! Oh my Victoria is back, Rose will soon find out that Gillian is really her daughter, and go Emerald!! While eating quick fix of dinner, my hubby called and told me that their census is low too! kaya uuwi daw sya by 11pm!! yippeee...i get to sleep with my hubby next to me!!! hay naku... i just wished everyday is like this!!! i've been planning to get my hair done since last week. my last haircut was 3 months ago, and the ends are starting (i mean started!!) to get dry already!! so i told myself that i should really have my hair cut by tuesday!! while browsing wella's blog found this site and decided to give it a try!! i was planning to do so much during my days off..but i ended up just staying inside our house where it is cool... the only problem is i am just wondering how much our energy bill will be next month...our a/c is pretty much open 24 hours for the last 4 days!!! and to help cool ourselves, we did a quick trip to seafood city market (filipino supermarket, like SM, in eagle rock city) and bought some merienda ingredients stuff. Eric asked me if i can make him "saging con yelo". 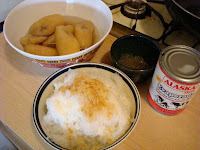 So i got few saba (added additional pieces for my turons), sago, pinipig, evaporated milk, and an ice shaver machine!! 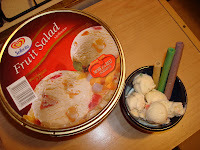 while strolling the supermaker i decided to get a gallon of selecta fruit sald ice cream and assorted flavored barquillos!! add to it the different local chips, different kakanins, and about 3 cans of big pineapple juice!!! our total bill= $50.73!! oh diba..merienda lang fifty bucks na..!!! aaahhhh!!! so we are a happy camper here in our house...with lots of merienda's to munch on...yun nga lang i forgot to shop for meats and vegetable that i'm planning to cook for this week!!! so i need to make another trip for my routine grocery shopping!!! 2. 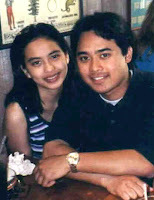 June 24, 2000 "our first date"- we spent the whole day in san francisco and from that day on we were inseparable!!! 4. december 14, 2006 "nursing graduation" and march 9, 2007 "found out that i passed the nursing board exam" - ever since i was young i've always wanted to become a nurse. and these two dates reminds me that i reached my life long dream!!! 5. 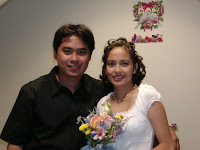 May 11, 2007 "Our church wedding"- in front of God, our parents, friends and relatives we pledged our life to each other. here's some of our pics !! so what's your most memorable nights? let me know okei?! !